The German Shepherd dog breed was bred from a number of sheep herding dogs in Germany. In 1899, Rittmeister Max Emil Friedrich von Stephanitz acquired a dog and set about developing a standard for the perfect German dog breed. This ideal dog breed would not only be a skillful sheepherder, but a proficient guard dog as well. As a result of Max von Stephanitz’s efforts, the German Shepherd dog breed today is a versatile dog excelling at not just sheepherding and guarding, but as a police dog, guide dog, search and rescue dog, and as a drug or explosive detection dog. The German Shepherd dog breed is not only highly intelligent, but he also has a biddable and devoted personality which makes him very easy to train. He is wary of strangers and protective of his home and family. German Shepherd dog breed is generally not aggressive unless trained to be so. He is good with children and with proper socialization, can be good with other pets. The German Shepherd dog breed can be a determined working dog. As a working dog, his energy level is between moderate and high. He needs a long walk or jog daily to stay fit. Games of fetch and/or agility are good for him too. The German Shepherd dog breed also has a need for high mental stimulation. Without mental stimulation, the German Shepherd dog breed can have destructive behavior problems such as chewing. Engage in the German Shepherd dog breed’s need for mental activities by training to fetch a frisbee, find a favorite toy, dog tricks, agility training, or any other fun dog games or activities. The American Kennel Club (AKC) standard of the German Shepherd dog breed requires that he have a harsh straight medium length coat. However, the hair around his head, legs, and paws are short. His double coat needs brushing 1-2 times per week, more often during shedding season. The German Shepherd dog breed should be black and tan, solid black, solid gray, black and gray, or brown and gray. Around the world, the German Shepherd dog breed can also be white, sable, cream, or a variety of other colors. He can also have longer or shorter hair. These traits, however, may not be accepted by the AKC. The German Shepherd dog breed stands about 22-26 inches tall and weighs about 75-95 pounds. He has a sloping back and a bushy tail hanging low at a slight curve. His body is longer than he is tall. And he should walk gracefully in a “floating” gait. The German Shepherd dog breed has tall moderately pointed hears which stand erect. He has almond-shaped eyes which should reflect his alertness and intelligence. His head should be mostly flat and only slightly rounded or arched. And his muzzle should be long and his jaws strong. The sloping back is a popular trait with the German Shepherd dog breed. Dog breeders have attempted to accentuate this trait, oftentimes to the detriment of the breed. Due to unscrupulous and overly extensive breeding, the German Shepherd dog breed is prone to a number of hereditary genetic health issues. The excessive breeding of the sloping back trait tends to cause more risk of bone disorders such as hip dysplasia, elbow dysplasia, and panosteitis. The German Shepherd dog breed is also prone to a neural disorder called degenerative myelopathy where he loses coordination and strength in his back legs. Other health issues include blood disorders such as von Willebrand’s disease, skin issues such as dermatitis and perianal fistulas, and eye issues such as pannus and cataracts. 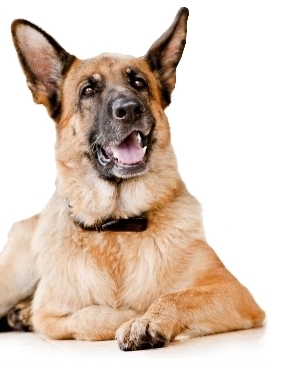 As a large dog breed, the German Shepherd dog breed is also susceptible to gastric torsion. And he also has a genetic likelihood of developing hemangioscarcoma which is where a malignant tumor develops in the lining of the blood vessels. Because of the number of potential health problems in the German Shepherd dog breed, it is very important that extensive research is done on the breeders before purchasing. A good breeder will be willing to show proof of the number of tests done on either the puppies or both parents. A good breeder will also most likely be a member of the German Shepherd Dog Breed Club of America. All the things which make a good breeder will also most likely make the purchase of a German Shepherd dog breed more expensive. Be wary of anyone selling puppies at a low price and of anyone who does not want you to see the home or facility where they keep the dogs. Other options besides purchasing a German Shepherd dog breed is to adopt one from the shelter or from a German Shepherd rescue group. Rescue groups sometimes have excellently bred dogs who just didn’t quite make the cut to be a good police or guide dog. The German Shepherd dog breed has a lot of quality characteristics which make him a perfect family or working dog. If raised properly and with sufficient socialization, he will have few, if any, negative personality traits. However, as great as this dog’s personality is, be aware of the potential health problems if he is not purchased from a reputable breeder. For information on how to care for and train a German Shepherd, and for more history information on the German Shepherd, check out “German Shepherd Dog – Barron’s Complete Pet Owner’s Manual“. This entry was posted on July 8, 2011 at 7:05 am and is filed under Dog Breeds. You can follow any responses to this entry through the RSS 2.0 feed. You can leave a response, or trackback from your own site. I didn’t know GSDs were susceptible to so many diseases, shame. That’s a very good figurine, very realistic. Thanks for sharing.